As soon as the air is filled with flickering heat and the sky over Berlin is painted in the deepest sparkly blue, my mind tends to travel to the South, I’m desperately lost in Mediterranean daydreaming. One of my favourite imaginary destinations – apart from Malta – is Italy. Take me to the soft hills of Tuscany, the Renaissance statues at Florence’s Piazza delle Signora, or to the ancient city of Rome and my heart is filled with joy. My schedule doesn’t allow me to travel in person, but thanks to two American girls and their gorgeous cookbook Tasting Rome I can travel without having to leave (although I wouldn’t mind moving south for a few days). The first time I was in touch with Kristina Gill, she asked me to come up with a sandwich recipe for her In the Kitchen With column on DesignSponge.com. She was happy with my creation, a lusciously stuffed Mediterranean Baguette, and we stayed in touch. I always assumed that Kristina lives in the US, Design Sponge is an American site. 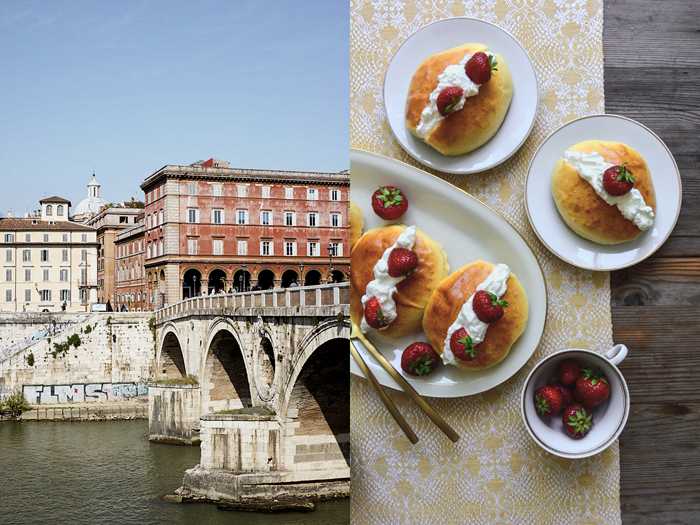 But the girl from Nashville moved to Rome almost two decades ago and dug deep into la dolce vita – into the culture, food, and history of her newly adopted hometown. Years of walking down Rome’s cobblestoned streets, soaking up the loud scenes on the piazzas, and passing by baroque fountains and silent palaces also made her aware of the city’s vivid contrasts. To see the past and present meet, old buildings taken over for unconventional use, kitchen traditions being respectfully transformed into contemporary dishes – this lively process fascinated Kristina. When she met her pal, Katie Parla, who’s a New Jersey native, the two girls realized that they explore and experience their city in a similar way. 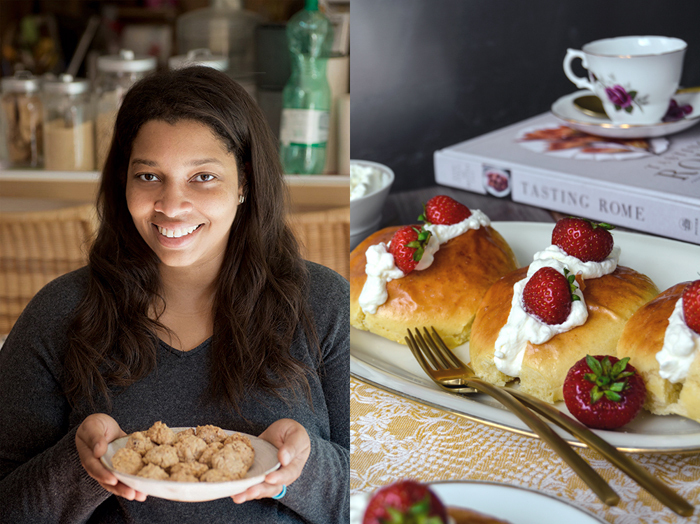 Katie, who has a master’s degree in Italian gastronomic culture, and Kristina, the photographer and food and drinks editor, both loved documenting Rome’s lost recipes and contemporary innovations. So they decided to use their vast insider knowledge to write a cookbook together. 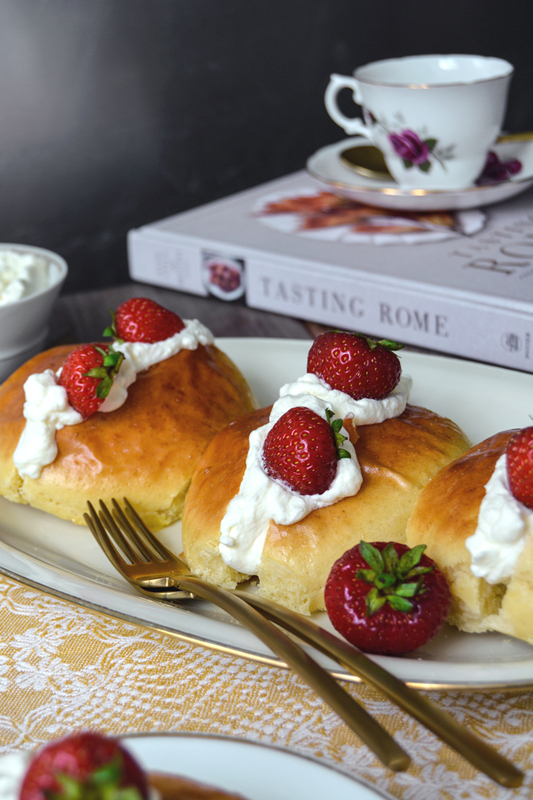 Tasting Rome is a collection of traditional Roman recipes and their modern interpretations. You can find pasta, vegetable, and meat classics side by side with scrumptious pizza variations and sweet Italian treats. I was impressed – and also glad – that the authors didn’t skip the city’s peasant tradition of using the whole animal, including offal, like sweetbread, liver, or tongue, and the more simple cuts of meat. It’s a tradition that corresponds with the great movement of eating sustainably and with respect for our environment. The two women developed the recipes together and asked the city’s great chefs for advice when it came to pizza and cocktails. The colourful pictures in the book that make you want to pack your bags and go straight to the airport – or at least to a Roman restaurant for dinner – were all taken by Kristina. Together, Katie and Kristina manage to share a taste of Rome through their words and delicious dishes. 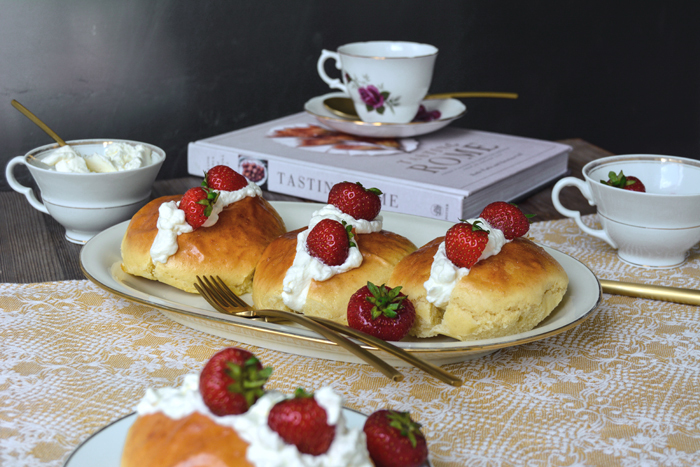 I chose to share their recipe for Maritozzi con La Panna with you, tender sweet yeast buns filled with whipped cream. Apart from enjoying 4 (!) of these little temptations in one go with great pleasure, I was quite impressed to learn about a very simple technique that they use to roll the buns to give them a tight surface. Usually, I roll yeast buns between my two hands, holding one like a dome and the other one flat, rolling the dough about 20 times. Tasting Rome taught me to use only one hand, rolling the piece of dough and pressing it against a lightly floured kitchen counter until it’s a firm ball. It works perfectly! 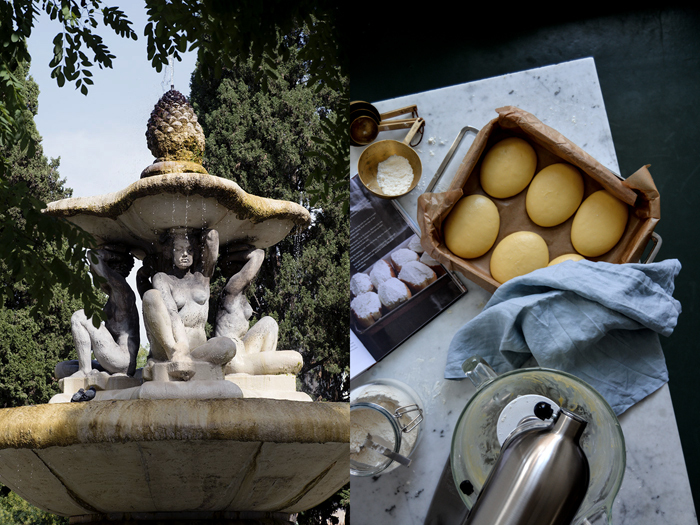 The beautiful Rome pictures are by Kristina Gill, the food pictures are taken by me. 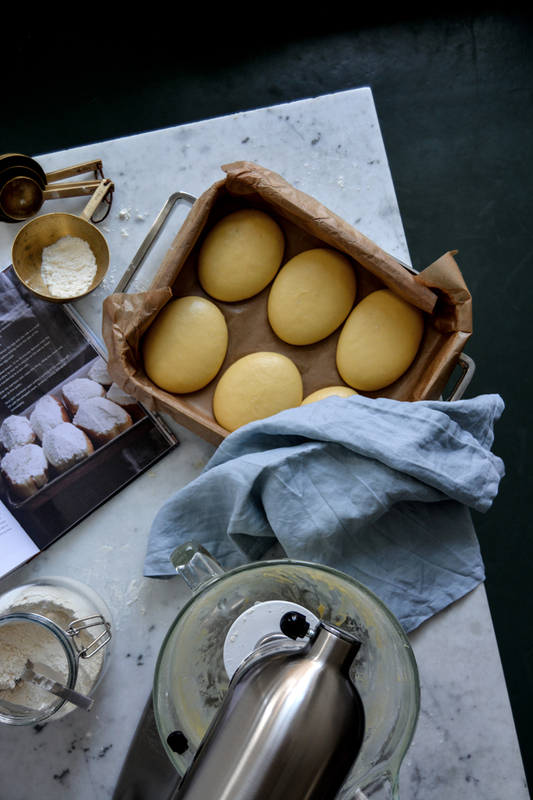 Make the sponge: In a medium bowl, whisk the yeast into the milk, then add the flour and sugar and stir to combine. Cover the mixture with plastic wrap and set aside until it becomes puffy, about 20 minutes. Make the dough: In the bowl of a stand mixer fitted with the paddle attachment, combine the butter, sugar, salt, and eggs on low speed. Replace the paddle with the dough hook. Pour in the sponge, mix for a few turns, then add half of the flour. Mix on low until the dough is smooth, about 5 minutes. Add the remaining flour and mix again on low until the dough is smooth, about 2 minutes, scraping down the sides of the bowl as necessary. When the dough was smooth, but still too sticky, I added 90g / 2/3 cup of flour and mixed it for another 2 minutes on ‘4’ on my KitchenAid. Turn the dough onto a lightly floured surface and divide it into twelve equal-size pieces (each approximately 70g / 2 1/2 ounces). Using one hand, roll each piece into a tight ball, pressing it against the counter to ensure a smooth, tight surface. Next, using both hands, roll each ball into an elongated loaf shape, fatter in the middle and tapered on the ends, about 4 inches long, similar to a small football. Place maritozzi on the prepared baking sheets, spacing them (at least) 4cm / 1 1/2″ apart. Cover with plastic wrap, then a kitchen towel, and allow to rise in a warm place (20-25°C / 70-80ºF) until doubled in size, about 2 hours. Preheat the oven to 175°C / 350ºF. Bake until deep brown, 12 to 15 minutes. Remove from the oven and allow to cool for 5 minutes on the baking sheet before transferring to a wire rack. Slice each maritozzo open without cutting all the way through. Fill with the whipped cream, dividing it evenly, and serve immediately. 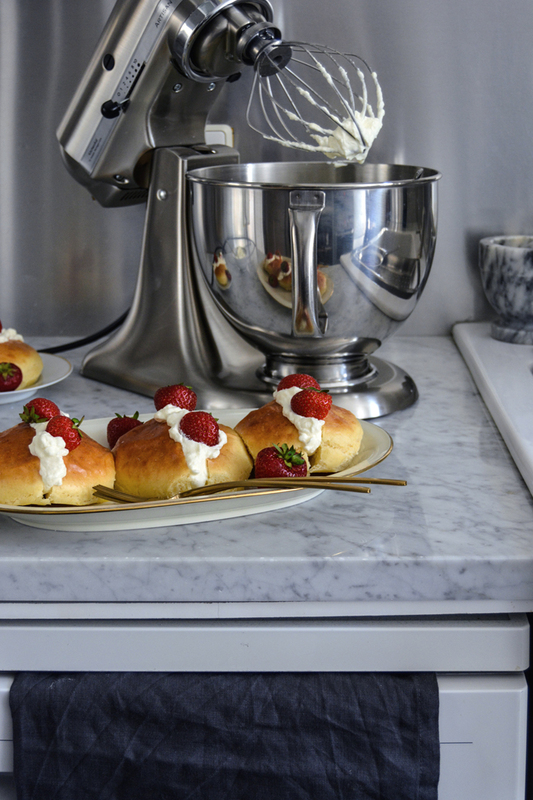 Optionally: serve with fresh strawberries. 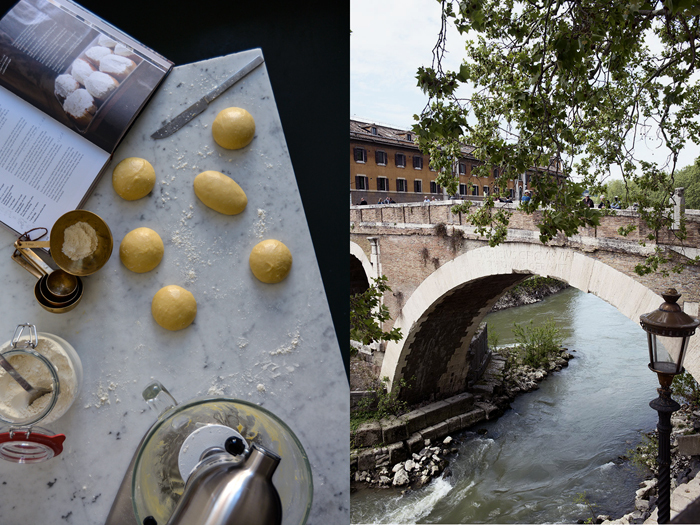 From Tasting Rome: Fresh Flavors and Forgotten Recipes from an Ancient City. Copyright (c) 2016 by Katie Parla and Kristina Gill. Published by Clarkson Potter/Publishers, an imprint of Penguin Random House LLC. When and why did you move to Rome? I moved to Rome in October 1999 for work. I was in the US diplomatic corps. What fascinates you about Roman culture? Was it easy to adapt, to become a part of it? Roman culture was a bit different then than now – internet was far less diffuse, and people were still pretty insular. It is hard to break into a ‘friendship’ culture in which bonds are created from childhood and don’t really change. Luckily, one summer several years before I moved here for work, I stayed in an apartment in Rome with other students, and they introduced me to their friends, so when I subsequently studied in Florence and Bologna, their parents made sure I was introduced to families in both cities with children my age. I guess you could say I adapted well because I was adopted! I spent a lot of time with these families – I was never alone on holidays. As time went on, the internet brought more curiosity about other places and people, and provided a way for Romans to cultivate their interests more – people wanted to connect more and that sped up forming relationships, especially around common interests, that their traditional network didn’t provide, so I’ve seen over time that Romans have become much more open to expanding their friendships beyond that childhood crew. What do you miss about your life in the US? Where to start? The cheeseburgers, the supermarkets, the variety of food available from different cultures, the variety of food available period, gourmet ice cream, parking, airconditioning, well-heated homes in winter… The ability to realize a dream with your own two hands. There’s a sense of freedom in the US that I don’t feel here – young people are leaving Italy in droves so that they can pursue their dreams. I’m lucky that I am able to be a part of both places. What is your favourite spot in Rome and why? My Savoir Bed is my favorite place…sleeps like a dream! But if you mean in the city, there are so many public squares to sit in and soak up thousands of years of history, which I find so mindblowing and relaxing. But lately, I think my favorite place is the MAXXI Museum, designed by Zaha Hadid, where I can check out contemporary art exhibitions. Just a small modern parenthesis in the middle of an otherwise gorgeous ancient landscape. Can you see yourself living in Rome for the rest of your life? I would like to move back to the United States to be with my family after so many years of being away and missing everyone. Seems like my cousins’ children were born last year, but are already studying at university!! I’ve missed out on a whole generation! You wrote your book, Tasting Rome, together with Katie Parla. How long have you know each other and who came up with the idea to write this book together? I can’t remember how long, however, we met over Twitter, a few years back. I already had the full proposal written when I met Katie, and a couple years after we knew each other, she mentioned that she had written a proposal, a memoir I think, that had been unsuccessful and was a bit down so I said – well, I have one that you might be interested in that we could do together! I sent it to her and asked her if she thought she saw herself in it. We added her name and bio to the proposal, and worked on some refinements with an agent I had already been in contact with. I approached Katie because I thought her knowledge of the history of Roman dishes and food culture would be a valuable addition to the book that would help ground it in fact and set it apart from the typical expat book that is written more from a personal perspective and is often an adaptation of cuisine. I wasn’t wrong! How did you develop the recipes in your book? From the proposal and through signing the deal, I was originally going to do all of the recipes and photography in the book, and Katie the features and headnotes, but once we started working on the book and came up with the list of recipes, there were clearly items that I had never eaten, like the offal chapter, and items for which I had no capacity to develop recipes, like the baking chapter and the cocktails chapter. Also, for the classics: Amatriciana, Gricia, Carbonara, and Cacio e Pepe, since Katie spends a lot of time eating out and had written numerous articles on which restaurants’ versions were the best in Rome, we agreed that she was in the best position to identify those recipes. That left roughly half of the book for me to develop, which I did over the course of four and a half months. Sometimes I did eat out to test recipes against my memories, but for the most part, I had clear ideas of how I liked the food I was working on, I knew the elements and knew more or less how to prepare. I had to check technical books for proper frying temperatures as starting points, or baking science (sweets). 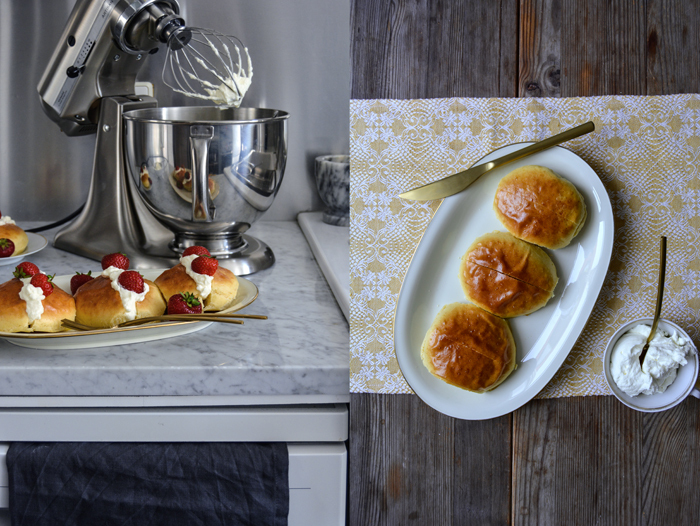 I did also consult with a friend who is a pastry chef for guidance on the maritozzi because I knew I wanted a rich soft brioche dough for that, and wanted to explore various options. I also talked with a couple of chefs to find out their views on the “proper” way to prepare certain dishes. Interestingly enough, they went over both the tradition and their variations. This gave some latitude and discretion in determining an approach for the book which remained authentic. For the other half, Katie procured recipes from local mixologists, local chefs and restaurant owners, and a good friend of hers who is an amazing baker for the baking chapter. When I look at the book, I think it represents the perfect mix of everything you would encounter in Rome today that defines Rome. On a personal level, Lucia, the mother of the family I stayed with when I studied in Florence. She has since passed away. She grew up in a town called Ristonchi a little outside of Florence, with chickens and a garden and the usual rural life. She could make the best food out of any ingredients you gave her. I loved the food made from leftovers the most. Her ribollita was the best on the planet, and her mother’s chicken broth which was liquid gold (and pure fat) made an indelible mark on my palate! She introduced me to Alessandra from Padova, whose mother, Gianna, took the cooking crown (and still wears it). Lucia, Alessandra and I both agreed that Gianna is the best – and between the three of us, we have eaten a lot of Italian cooking. Eating at Gianna’s house was better than any restaurant – and she took ‘orders’ in the morning before each meal so that when lunch or dinner came around, you had anything and everything you wanted. My inspiration from Gianna and Lucia came from their knowledge of how to prepare food, and how to be resourceful, and really how to eat. Gianna’s father was a baker. Food was always a central part of both households and you could tell that each meal was to be savored. Has food always played an important role in your life? Do you come from a family of foodies? Not really in the way you would think. I grew up in a household which consumed its fair share of whatever junk food was popular at the time – but which also shopped at the farmer’s market for weekend meals. My grandmother kept her own garden and fruit trees, and three freezers to keep all the produce throughout the year. I used to think she was a magician because this amazing feast appeared on the dinner table from food I hadn’t seen in the refrigerator during the day. It wasn’t until I was older that I learned about the other freezers!! You took all the pictures in your book, when and how did you discover your passion for photography? What do you love about it? I started taking pictures to be able to produce the In the Kitchen With column on DesignSponge, in 2008 I think. I think I started to love photography when I started taking more than just food pictures and found that capturing my environment was a way to see all the things I overlooked when I just passed through on my daily routine. It was like discovering a new world. Do you prefer to capture the atmosphere of a city with your camera or delicious food? Both. I love to explore a culture through its food, why certain ingredients or cooking techniques play the role they do, how the cuisine of one city differs from another and why. I love to capture the mundane and everyday of a city with my camera. I can’t remember! But in high school I think I used to make pizza from ready made pizza dough, and at university, I prepared a meal from an African cookbook, featuring mostly Ethiopian food and my friends and I all liked it a lot! What are your favourite places to buy and enjoy food in Rome? My Saturday routine is concentrated in one neighborhood. Before the market I have a pastry (made in house) from Fabrica, a cafe near the market. Then at the Trionfale market I buy fish, produce, and a lot of Asian food staples (lime, rice noodles, bok choy, tamarind paste, palm sugar, ginger, galangal etc). I get cheese and nduja from La Tradizione (which is near Trionfale market). I pick up wine and alcohol from an enoteca named Costantini. I pick up oatmeal (flakes) from the healthful store around the corner from my office. It is a chain called Il Canestro. When I don’t have time for breakfast at home, I stop by Bar Benaco on the way to work because they make all their pastries in house and I can get them while they are still warm. I don’t eat out a lot because I have a bazillion cookbooks and am always excited to try new recipes, but when I do, I eat most often at Cesare al Casaletto because they always find me a table, or takeaway pizza from a place near my house or at pizzeria Tonda. Bryant Terry, anything he’d like. I would love it all. Unless it had beets in it. I learned about Bo Ssam pork at a meal at Matt Armendariz and Adam C. Pearon’s house. I would prepare Bo Ssam, and a selection of Asian-inspired salads. For dessert, a maple hazelnut cookie by Nigel Slater, and a selection of chocolates and coffee. 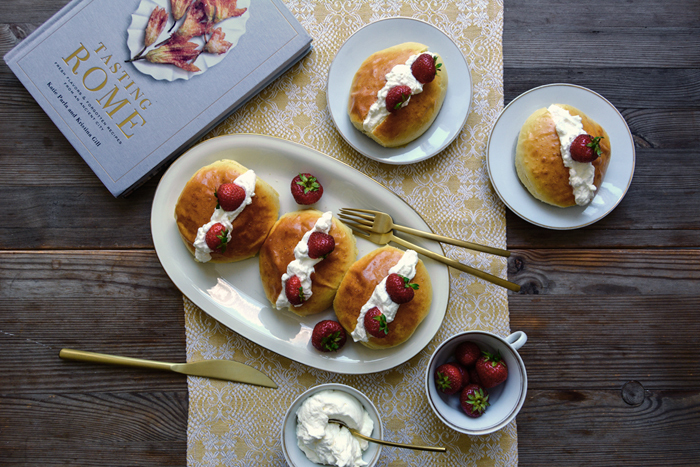 I’ve spent a lot of time over the past two years working on the book alone – not just developing the recipes, but also preparing food for the photography. I styled about half of the recipes in the book, and Adam C. Pearson did the other half and the cover. When I was in the studio shooting, I did a lot of food prep as well, and enjoyed the atmosphere and working with Adam and his team of stylists. It’s definitely easier working with others! But sometimes, cooking is therapy and being alone is great. As long as it’s good, either is fantastic! I made some dog biscuits for my dog once that were made of like chopped liver and garlic or something. When they started to bake, the smell was SO BAD, I thought I’d have to move out of my apartment. He loved the cookies, but that smell stayed around for a LONG time and it was AWFUL.